What is a leopard gecko? The leopard gecko is native to arid habitats of Pakistan, Eastern Afghanistan and Iran, and Northwestern India. The name Eublepharis macularius refers to the fact that it has a moveable eyelid (eu = true, blephar = eyelid), and is spotted (macula = spot, blemish). The leopard gecko is commonly kept as a pet, and is available in a variety of colour morphs. Why do you use leopard geckos? 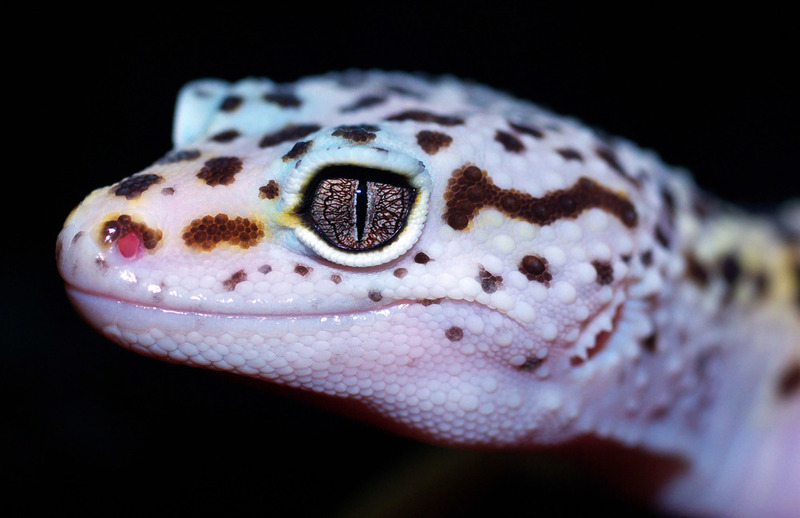 We use leopard geckos to study multi-tissue regeneration. Leopard geckos, like many other lizards, are able to voluntarily detach their tail, a process known as autotomy. Following tail loss, leopard geckos can regenerate a new tail. You can read more about tail regeneration and see some cool pictures in our publications. We use leopard geckos as they are tolerant of handling and adapt well to the lab environment. Can your geckos stick to walls? Nope, they don't have those kind of feet. Although they do not stick to walls, we do keep lids on their tanks because they are good at climbing. What do you feed your geckos? Our geckos eat mealworms which have been gut-loaded and dusted with Calcium+D3 powder. Gut-loading means that we feed the mealworms things like carrots, orange peels, and green peppers before we feed the worms to the geckos. And yes, we feed the geckos live worms, because "hunting" is a form of enrichment for the geckos. They are commonly referred to as crepuscular, which means that they are most active at dawn and dusk. We keep our geckos on a 12:12 photo period. Yes, our geckos are ectotherms. This means that they depend on their environment for heat, and their metabolic rate is dependent on their body temperature. We keep our geckos in an environmental chamber at 27-28° C. Additionally, a heating cable is run under the one side of their enclosure, and they will go and lie on that if they need to warm up (i.e., when digesting).